Yippie! We have one more day before Spring Break. Of course it is going to be a crazy day since we have Friday tests, Career Day, sack lunches, and Spring Snack tomorrow. Yeah it's going to be a jam packed day! It's that time of year when we are super busy trying to fit in review of everything that our students are still struggling, make sure we've covered all the standards, and pushing to get everything mastered. In my classroom, I've noticed my kiddos are struggling with capitalization of words that come in the middle of sentences. They know that a sentence starts with a capital letter, but they struggle with remembering to capitalize proper nouns. To squeeze in a little bit of practice, I've made a game. Baby bird rescue is a quick partner game to review capitalization. You can get it by clicking on the picture. 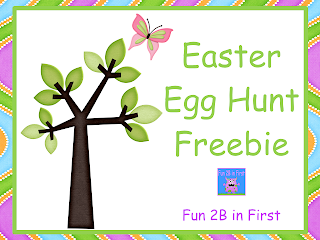 If you like the freebie, you might want to check out my Sweet Tweet Spring Centers that I've posted on my TPT & TN stores. It's a complete set of six math centers reviewing addition, skip counting by 2s, word problems, number comparison, and fact families. 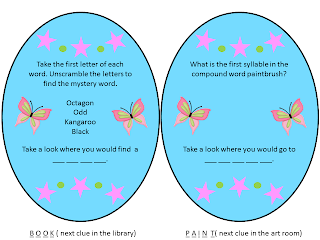 Finally, I am linking up with Mrs. Lirette's Learning Detectives for her linky party. If you want to get some more great ideas for Spring activities you can hop on over to the linky party by clicking the picture below. Today my kiddos and I reviewed some language arts skills we covered this year. Each student got a little whiteboard, a dry erase marker, and a tissue. You would have thought they had died and gone to heaven from the cheering when they got a right answer. Who would have thought something so simple would make test prep so much fun. Games are another way I like to sneak in a little test prep. Synonyms and antonyms are skills I want to review with my students. So, I made a little Saint Patrick's Day review game and I am sharing it as a freebie for you. It can be played with partners or small groups. Another skill I want to review is vowel sounds. So, I made a game for that too. Just click on the picture of the game(s) you want to grab your copy. Other recent St. Patrick's Day freebies I've posted include Bump, Four in a Row, and Lucky Leprechaun. If you enjoy them, please consider leaving a comment of following the blog. Thanks for stopping by! 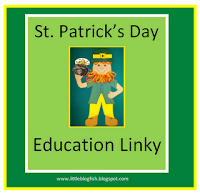 If you are looking for more Saint Patrick's Day resources, Robin at Little Blogfish is having a St. Patrick's Day linky party. Don't you just love it when you find new blogs to read? That's the idea behind the linky party going on over at Kindergarten Lifestyle. The goal of this linky party is to help people find blogs in the kindergarten to second grade range that they might not have seen before. Check it out. If you found me through the linky party, please take a few minutes and explore my sight. I'm glad you stopped by. I don't know if you know the song Alice the Camel, but it is stuck in my head, especially, the line where everyone used to bump hips at summer camp. Why? Well, I've been busy making these cute little freebies. Yep, I made Bump game boards. Bump is a great game for practicing addition facts to 12. Students roll a pair of dice and cover up the sums. They can bump the other player off if they roll a sum that's already been covered. Fun! I love it when learning and fun "bump" into each other. Seriously, that was corny, but I do love it when the kids are having fun while they learn. Just click on the picture for the version(s) you want. As always, I appreciate comments and I love followers. Let me know if you like these and I'll keep making them. This week is the last week before Saint Patrick's Day. How did that happen? Time seems to be flying this year. Even though Saint Patrick's Day is on a Saturday this year, I am hoping to at least squeeze in some themed activities. So, I made this super simple 4 in a Row game for the students to review addition. Of course, I might not get to it this week since we are furloughed on Thursday and Friday. We also have benchmark testing, several special events, and a half day training. Yep, that's all got to fit into three days! I made a second version just in case I don't get to use the St. Patrick's Day version this week.The second version is played just the same way, but it is Spring themed. You can get both versions by clicking on the pictures or clicking here. Oh, there is a really cool event going on at the Lesson Cloud, where I am a contributor. The Lesson Cloud is going green and will be sharing some really cool stuff over the next couple of days. Be sure to stop by and check it out. Wow! I love reading the comments you gals (and guys) leave. I am a bit overwhelmed and definitely flattered. Karla over at Life in Special Education and Adrianne from Kids Cog Works awarded me the One Lovely Blog Award. Like most awards, it has a few rules. 1. Link back to the blogger who gave you the award. Be sure to check out the awesome blogs above. 2. Pass the award on to 15 other lovely bloggers. 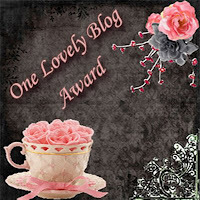 I am passing on the One Lovely Blog Award to the following blogs. 3. Become a follower of the person who sent it to you. Also, Nicole from Teaching With Style awarded me the Liebster Blog Award. You can check out her awesome blog here. The rules for the Liebster Blog Award are as follows. 1.Thank the award presenter and post a link back to their blog. 2. Put the award on your blog.3. Pick 5 blogs with less than 200 followers, let them know about the award, and encourage them to pass it on. I am passing on the Liebster Blog Award to the following blogs. Thank you to Karla, Adrianne, and Nicole for the awards. I hope everyone finds some awesome new blogs to follow and as always thank you for taking the time to stop by my blog. My absolute favorite book to use for teaching persuasive writing is "Hey, Little Ant." It is the perfect book for teaching persuasive writing. It takes the form of a debate between and ant and a little boy. The boy wants to squish the ant and argues why he should. The ant argues why the boy should let him go. The story ends with the little boy's shoe still up in the air and no decision having been made. We read the story and then make a t-chart with reasons why the boy should and should not squish the ant. Then, I model ask the class who thinks the boy should squish the ant and who thinks the boy shouldn't squish it. Next, I will model completing a graphic organizer listing my opinion and three reasons. After I have modeled it, the students complete their organizers. Next, I model showing the kids how to write a persuasive paragraph arguing their point of view. Once the kids have written their paragraphs we hang it up with a cute shoe that they colored. Some of the kids thought the boy should squish the ant. Other students thought the boy shouldn't squish it.